Every 5,000 miles an oil change indicator light that reads, "MAINT REQD" is automatically switched on in theToyota Prius. This light is not an emergency!, it is a reminder that it has been 5,000 miles since your last oil change. If you change your own oil, or go to a quick lube shop, you will have to switch off your Toyota Prius's oil indicator light yourself. Below is a very simple four step process that should turn off the MAINT REQD light for your Toyota Prius (and possibly other brands as well). Turn your ignition key to the 'ACC' or 'LOCK' position. Press and hold the trip meter reset nob (next to your Toyota Prius's odometer). While holding the trip meter reset nob, turn the ignition to 'ON', but do not start your Toyota Prius. Hold the meter reset until the MAINT REQD light switches off. Get in the vehicle and shut the door. Press the start button once *. Press and hold the odometer reset WHILE pressing the start button. 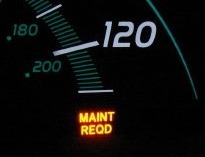 The screen should indicate that the MAINT REQD indicator light is resetting. * Make sure to not press on any other controls in the vehicle (including pedals) during this reset process. If this procedure does not successfully reset your maintenance required light, make sure that your digital odometer is set with the odometer reading showing and try again. If the light is still lit, you can try disconnecting your Toyota Prius battery, causing the internal computer to reset. 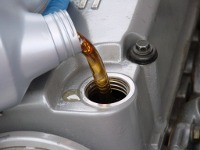 If you still haven't successfully turned off the oil indicator MAINT REQD light, please read your manual or contact your dealer for further instruction!